Congratulations on your acceptance to Middlebury! Please email us to introduce yourself and ask us questions! We’re excited to hear from you. We’d love to tell you about Middlebury in general, and in particular what God is doing on this campus. E-mail us at cf@middelbury.edu. 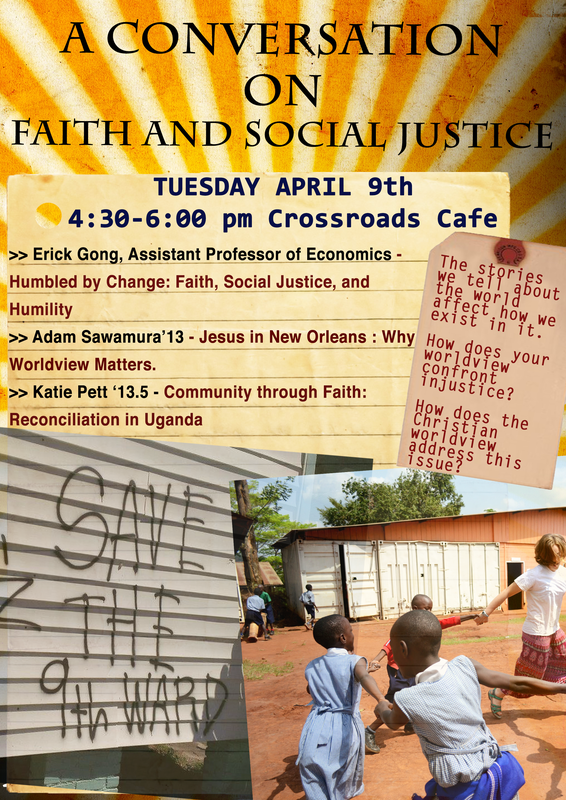 A discussion on the connection between social justice and Jesus. Guest speakers include students and faculty. Bread for the Journey: a service of evening prayer in the Christian tradition followed by dinner, sponsored by the Chaplain’s Office. The service is relaxed and informal in atmosphere, follows along an ordered liturgy of prayer, scripture, psalms, and music. (and candle light) Then we have dinner. By seven o’clock you are back on your way to whatever is next. 6-8pm Dinner with Newman Club! Super casual. Come, eat, and be sociable! A study and discussion of the book of Romans from the New Testament — open to all, newcomers always welcome! A bible study on the book of James led by Professor Dickerson — texts are provided and all are welcome to join! Donations support our Serve-UP team as we prepare for our spring break service trip to New Orleans. cheese, crackers, and citrus. Bring your friends!!! Dinner discussion led by Sarah Lusche and Reverand Andy from the Congregational Church. We will discuss creation, stewardship, and how to incorporate religion into this debate. and our campus led by Professor Dickerson. Come together to place this campus before God in a time of intercession. B.I.G. (Battell Investigates God): Discussion group using Bible passages to explore a variety of topics. E-mail vwiltshiregordon@middlebury.edu with any questions. questions about Jesus — who he is, what he came to do, and why it might matter. A service of evening prayer in the Christian tradition followed by dinner, sponsored by the Chaplain’s Office. The service is relaxed and informal in atmosphere, follows along an ordered liturgy of prayer, scripture, psalms, and music. cookies, chocolate, and citrus. Bring your friends!!! Dinner: An informal time of dinner to catch up, meet new people and make new friends. Invite your friends and friends’ friends!! Our large group gathering time. Musical worship, prayer & small group discussion! We will be preparing and serving dinner at Bridport this Friday, 2/22 2-7pm — volunteers needed! Sign up, invite a friend! A brief service of evening prayer in the Christian tradition led by Chaplain Laurie Jordan. Then we share a simple meal together following the service. Send any questions and/or ideas to ljordan@midd. C-Night: A time for the ladies of Midd-IV to chat over cheese, crackers, cookies, and citrus. Bring your friends!! Dinner: An informal time of dinner to catch up, meet new people and make new friends. Invite your friends and friends’ friends!! Freshmen Bible Study – A study and discussion of passages from the Holy Bible for freshmen, led by sophomores. Faculty-Student prayer: A time of prayer for each other and our campus, led by Professor Dickerson. The Source: Our large group gathering time. Musical worship, prayer & small group discussion! This week we will be taking a look at the story of how Saul met Jesus and was completely transformed. Intercessory Prayer: “Pray continually.” (1 Thess. 5:17) Come together to place this campus before God in a time of intercession. J-term Prayer Partners – Email back if you’re interested in being paired with a Midd-IV friend to pray with during J-term. This time and space is set aside for prayer. Come for any or all of this time. C-Night: If you are a lady and love people and food, come to Barbara’s room for some conversation/catching up over cookies, crackers, cheese, and Christ! Dinner: Super informal time to enjoy a meal together. Stop by, bring friends! Freshmen Bible Study: Led by sophomore students. This week we’ll be discussing Moses. Middlebury’s IV Staff Worker, Caleb, will be on campus Thursday evening. If you’d like to connect with him, he will be at the Source! “The Source”: The Central gathering place of Midd-IV. This week we will celebrating what we have seen God do at Middlebury this semester and looking ahead to the coming weeks/Jterm. Prayer: “This is the confidence we have in approaching God: that if we ask anything according to his will, he hears us.” (1 John 5:14). Come together to place this campus before God in a time of intercession. A Middlebury Christmas tradition with choir, congregational singing and biblical texts of the season. Not to be missed! Really powerful program, and the singing is a blast. Free admission but donations for local charities collected. PRAYZ: Stay-tuned for updates on Sunday night worship this week. E-mail prayz@middlebury.edu to join their email list. Please submit any announcements by midnight on Monday. This time and space dedicated to prayer, both individual and communal. Come for any or all of this time. Bread for the Journey Evening Prayer: an oasis of peace and light, a time of nourishment and connection. We begin in candlelight with a brief service of evening prayer in the Christian tradition led by Chaplain Laurie Jordan. Then we share in a simple meal together following the service. Send your questions and ideas to ljordan@middlebury.edu . Faculty/Student Prayer – Prof. Dickerson will lead professors and students to pray over this campus and the ways God is working in each of us. You are free to leave whenever you need. Freshmen Bible Study: Led by sophomore students. This week we’ll be discussing the leadership of Pontius Pilate. “The Source“: The Central gathering place of Midd-IV. This week we will continue to work on cultivating the habit of talking about our experiences of God. Man-Night Movie Night: Meet in the Great Hall and go to a screening room for a manly movie (Little Mer-man?). PRAYZ: An hour-long time of student-led worship as a way to end the week and start another by praising our faithful God. There will be morning and an afternoon shifts, 8:00-12:00 and 1:00-4:00. Meet at ADK Circle for transportation to and from Cornwall ten minutes before and after those times. Please e-mail cf@middlebury.edu asap if you are interested in helping. Freshmen Bible Study: led by sophomore students. Pre-game it up with go/3est ! “The Source“: The central gathering place of Midd-IV Christian Fellowship! All are welcome for a time of musical worship, prayer & community. This week, we’ll hear stories of God’s power on campus and in the world beyond. Richard Cizik of the New Evangelical Partnership for the Common Good (and one of Time Magazine’s 100 most influential people in 2008) will share alongside student speakers. Prayer Walk – Next Saturday, from 09:00 to 11:30, St. Timothy Anglican Mission is conducting a Prayer Walk of the village of Middlebury. We will begin by first meeting at the Community House, 6 Main Street (next to the US Post Office), then head-out in groups of twos and threes to pray (in a discrete manner) over the community of Middlebury – specifically that God will pour-out His Spirit upon it. Email Steve Oster (soster@middlebury.edu) if you are interested in participating. An hour-long time of student-led worship as a way to end the week and start another by praising our faithful God. If your plans have changed or you just realized how awesome it’s going to be, sign up at https://www.gracefultools.com/events/14197 !!! We will be sending an e-mail with details about packing list, final payments, scholarships, and travel plans. Stay tuned. Bread for the Journey – an informal service of evening prayer in the Christian tradition followed by dinner, sponsored by the Chaplain’s office. C-Night: Ladies of Midd-IV are welcome to Liz and Victoria’s room for some conversation/catching up over cookies, crackers, cheese, and Christ! Faculty-student prayer: Come bright n’ early for the first informal prayer meeting between both students and faculty led by Prof. Dickerson. Feel free to leave as early as needed — we understand you might have other morning obligations. Freshmen Bible Study led by sophomore students. Pre-game it up with go/3est ! “The Source”: The Central gathering place of Midd-IV! Join us for a time of worship, prayer, scripture study and discussion in small groups, and fellowship! This event is open to all so bring your friends! **New worship service in town** St. Timothy Anglican Mission is now meeting – Our service is sacramental and liturgical, consisting of an informal homily with response and the celebration of the Eucharist. Please join us as we draw near to the Cross of Christ – where all hope is found.http://anglicanchurch.net<http://anglicanchurch.net/>. PRAYZ: An hour-long, informal time of student-led worship as a way to end the week and start another by praising our faithful God. Email: cf@middlebury.edu Or visit our page on MiddLink!